The arts in Liverpool isn’t letting the typical August lull put a dampener on things, Getintothis’ Cath Bore digs deep and still finds lots to look forward to. As Liverpool Biennial continues apace, the traditionally dry month for Merseyside’s smaller and more intimate events still has a smattering of goings on, despite some organisations taking a summer break. After the school holidays are over, activities for adults warm up as the temperatures take a dip. Away from the city centre, Linghams Bookshop in Heswall is holding an Afternoon Tea with No 1 Ladies Detective Agency author Alexander McCall Smith on September 29, ticket details here. Manchester’s Louder Than Words Festival is back in November, the annual celebration of words – oral, written and published, about the music industry features Kristin Hersh, Brix Smith Start and Kraftwerk’s Wolfgang Flür, with more speakers to be announced on the website. New film Childhood of a Leader, score written by Scott Walker, fails to win a screening in Liverpool but Manchester’s Home is showing it from 19th August. Liverpool Small Cinema holds the city’s film end up this month, presenting biopic The Notorious Bettie Page on Aug 11. Tickets here. Write Blend bookshop in Waterloo hosts author events this month. On Aug 12, crime authors Anthony Schumacher and Luca Veste are in conversation, and on Aug 20 James Rice will tell Sally-Anne Tapia-Bowes about his psychological thriller Alice and The Fly. Chester Literature Festival returns between October 8 – 23, a solid fortnight of authors, poets and musicians from around the UK. David Bowie fans can fill their boots further as his legacy is explored by music writers Paul Morley and Lesley-Ann Jones in separate events on the same evening. Also during the festival, The Minaturist author Jessie Burton will talk about her new novel The Muse, and Hollie McNish performs poems, read from and chats about her latest book, Nobody Told Me. Full details are here. Also in October Liverpool Literary Festival makes its debut. Organised by the University of Liverpool, this new festival’s discussions, readings and debates include novelist Frank Cottrell Boyce exploring the influence of David Bowie‘s favourite books. The Three Women Revolutionaries panel discussion has Shami Chakrabarti, and 200 Years of Frankenstein is with Philip Pullman. Liverpool Literary Festival‘s full itinery is here. Here’s a top of five happenings we’re looking forward to most during August. The city’s feel good festival celebrates the positive Liverpool has to offer. Four fab core themes – Business, Culture, Food and Wellbeing are explored over three days with Liverpool Loves Business, Liverpool Loves Merseybeat. Liverpool Loves Festival Day on the Main Stage on August 6 has music by Tea Street Band, The Wicked Whispers, Shamona, and Eleanor Nelly. Merseyrail Sound Station Pop-Up featuring GIT Award nominee L U M E N, and at the Soulfest Stage, Luke Cusato. Showcasing women’s creativity and addressing the gender inequalities in contemporary art, literature and music, Grrrl Power Liverpool‘s exhibition launch night is followed by an after party with JELL and FAUX QUEENS. On August 7 will be workshops led by Queen of the Track Zine and XXY Magazine, screen printing, plus Burn Your BraBQ in the garden. Full details and early bird tickets are here. Liverpool has a burgeoning number of open mic events throughout the month that welcome spoken word alongside the more typical open mic fayre of poetry. The Egg’s monthly Come Strut Your Stuff is on 1st August. Newington Temple, formerly Bier, hosts an open mic every Thursday night. LEAF takes a break this month but sneak one open mic under the line on 30th August. Poetic Souls is at Coffee & Fandisha on August 26, and the last Friday of every month. On Aug 9 and on the second Tuesday of every month, Rhymes & Records hosts spoken word and poetry at the Jacaranda. Produced by salt water poetry, performances are filmed and added to Jacaranda Records’ YouTube channel. £3 entry, performers get in for free. Waterstones Liverpool One launch a prose and poetry only open mic on 14 September. More info. Still Life under the Lamp’ by Pablo Picasso. © Succession Picasso/DACS, London 2016. Image courtesy of Trustees of the British Museum. 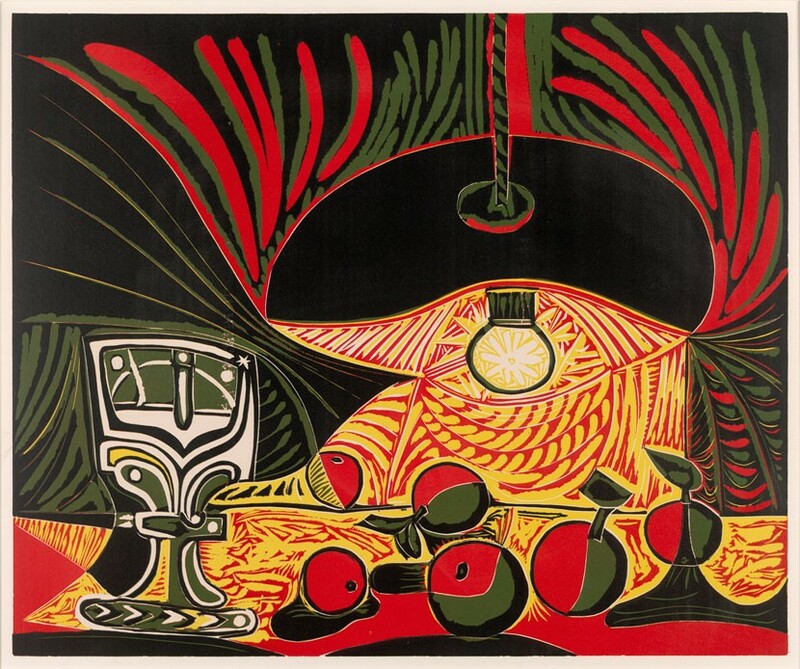 This exhibition features 17 large linocut prints by Pablo Picasso, on display for the first time outside the British Museum. Linocutting was a technique that Picasso explored in the late 1950s and early 1960s and the prints included in this exhibition were made in 1962 when Picasso was 80 years old. The artworks featured will include prints from the Jacqueline Reading series – his wife and muse – and the Still Life under the Lamp series. On August 20, flamenco and Spanish guitarist Glenn Sharp performs a mixture of improvised flamenco and traditional Spanish classical guitar. Singer-songwriter Roxanne de Bastion will be performing The Beatles’ iconic Revolver album, fifty years to the day since its release, together with some of Liverpool’s best new musicians and songwriters. She Drew The Gun, singer-songwriter Thom Morecroft and avant-garde Baroque-pop song writer FABIA are confirmed so far. A Liverpool Acoustic event, further updates are here.